GOD’s kingdom advance in the harvest fields of Rwanda has been relentless with the gates of hell crumbling and Christ’s bride ever increasing - brothers, sisters, new family in Christ! HIS blessing upon us, e3’s “Reach the Rest” team invites those wholehearted, same minded, and wholly vested to come and invest deeply in the discipleship of reproducing new believers generating “I Am Second” (IAS) groups that multiply even before the expedition ends! We need Bibles to make this happen. We desire to put the Word in the hands of new believers so they can continue to grow in Christ and share with their community. There in no better way for transformation and reconciliation within this war stricken country than by breaking bread together. 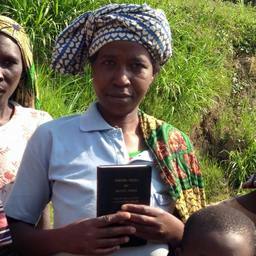 Our hope is to leave over 500 full bibles in Rwanda for the new believers in the I am Second Bible fellowships after our 2019 expeditions. If you would like help provide Bibles, click on the link below. Each Bible is $7.00. This would be an incredible small group or Sunday School project!